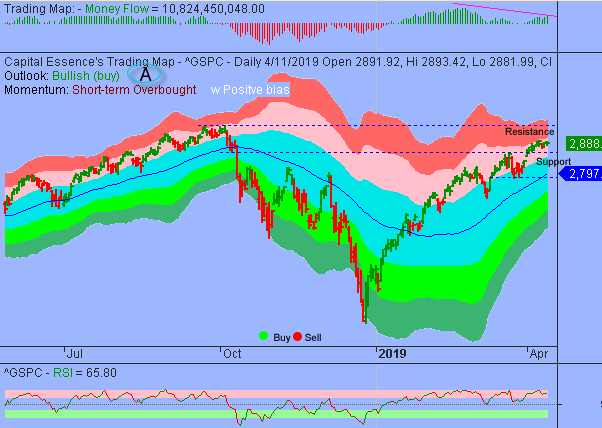 Good Morning, this is Capital Essence’s Market Outlook (the technical analysis of financial markets) for Friday April 12, 2019. We’ve noted in the previous Market Outlook that: “although Wednesday trading action was very encouraging, there is no reason to turn particular bullish unless the bulls manage to take out key technical resistance at the important sentiment 2900 mark on the S&P. Our near-term technical bias is that for the near-term further consolidations could be unfold between 2860 and 2900. Short-term traders could play the range. However, markets are volatile and traders may prefer not to hold large positions overnight.” As anticipated, the S&P finished little changed on Thursday in a tight-ranged trading session. The Dow Jones Industrial Average lost 0.1 percent and the Nasdaq Composite lost 0.2 percent. The CBOE Volatility Index (VIX), widely considered the best gauge of fear in the market, fell more than 2 percent to 13.02. The health care sector is a noticeable laggard Thursday as traders looked to reduce exposure from the year’s worst-performing sector. As such, the iShares NASDAQ Biotechnology ETF (IBB) fell 1.7 percent on the day but is up 16 percent YTD, roughly in line with the S&P. Now the question is whether recent pullback is a pause that refreshes or it’s a beginning of something worse? Below is an update look at a trade in IBB. Our “U.S. Market Trading Map” painted IBB bars in red (sell) – see area ‘A’ in the chart. 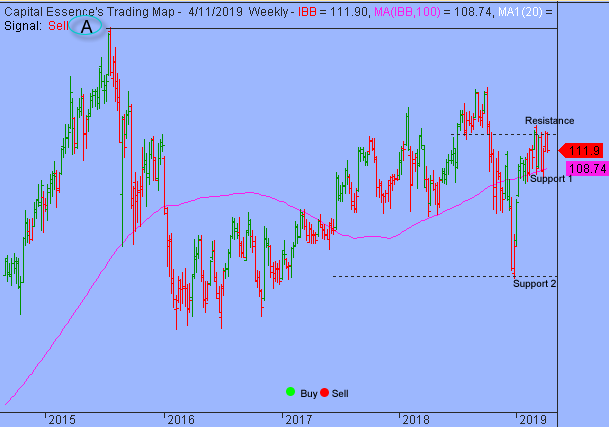 Over the past weeks, IBB has been basing sideways using the 2-year moving average, a key technical level, as support after the late 2018 rally ran out of steam near the October 2018 breakdown point. This is a bearish development, suggesting that the ETF might have to go to a much lower level to attract new buyers. Support is strong near 108. A close below that level has measured move to 89, or the 2018 low. IBB has resistance just above 116. Short-term traders could use that level as the logical level to measure risk against. The big picture remains the same. S&P continues basing sideways near the important sentiment 2900 mark. Money Flow measure is registering a weak bullish signal. The indicator peaked in February and formed a lower high as prices ascending, suggesting less and less money are chasing the rally. While more backing and filling would not be a surprise, a close below 2850 would see a massive pickup in volatility. We’d turn particularly bearish if the index closes twice below that level. Short-term trading range: 2860 to 2940. S&P has support near 2865-2850. A close below that level has measured move to 2800. The index has resistance near 2900. A close above that level will bring the 2018 high, near 2940, into view. In summary, recent trading actions leaving the S&P in what looks to us like an orderly high level consolidation of the March rally. The index is ticking ever closer to 2900, a level it has not breached since market broke down in late 2018. Some aggressive traders might use this level like a magnet to sell against, but it doesn’t have much significance outside of just being a nice round number.